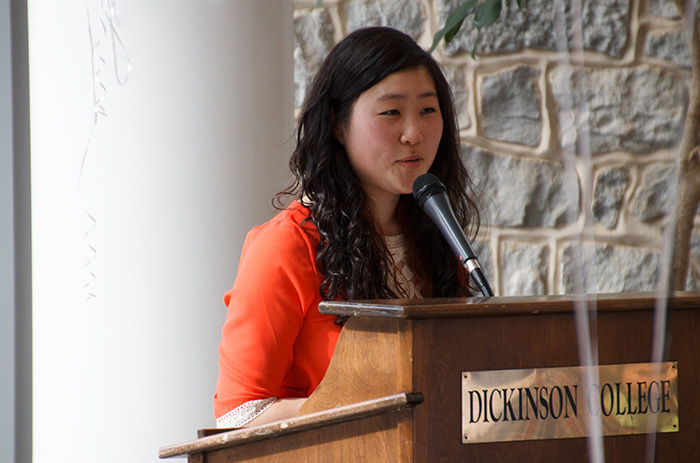 Gloria Hwang '16 delivers a brief address during the spring 2014 launch party for the Dickinson Science Magazine. Photo by Carl Socolow '77. Rising junior Gloria Hwang was one of just 35 students nationally to receive a scholarship from one of the most prestigious honor societies in the U.S. Alpha Lambda Delta (ALD), which celebrates its 90th anniversary this year, also honored its Dickinson chapter with a 2014 excellence award. Founded in 1924, ALD recognizes first-year college and university students who “promote intelligent living and a continued high standard of learning” by maintaining a 3.5 or higher grade-point average and ranking in the top 20 percent of their class. ALD membership is lifelong, and members may attend national leadership workshops and compete for scholarships and graduate fellowships. One hundred and twenty-nine Dickinson students were invited to apply for membership last year. Sophomore-year ALD members may compete for the Jo Anne J. Trow Undergraduate Scholarship, named in honor of a distinguished ALD past president. Selection is based on academic achievements; participation in ALD, campus and community activities; and the strength of the applicant’s personal essay. A biochemistry & molecular biology major and graduate of Thomas S. Woolton High School (Rockville, Md.,) Hwang joined ALD in spring 2013 and remained on the Dean’s List the following year. She emerged as a dynamic student leader when she founded the Dickinson Science Magazine, a student-run publication that corrals faculty and student reports on science and science-related news, research, entertainment and op-eds. Hwang applied for the society’s undergraduate scholarship in April with guidance from Chris Francese, The Asbury J. Clarke Professor of Classical Studies , and was awarded $1,000 for use during her junior year. According to ALD President Susan Melson Huffman, Hwang and her fellow 2014 Trow awardees were part of an “extremely strong” applicant pool. Selecting just 35 recipients “was, as always, a challenge,” she said. The honor society also honored its Dickinson chapter. After receiving the ALD Order of the Torch award last year in recognition of its exemplary programming, activities and service, the college was awarded the ALD Maintaining the Flame award, denoting continued excellence in this regard. Announcing these honors to the campus community, Shalom Staub, associate provost of academic affairs & civic engagement, wrote that the dual awards are feathers in the cap for the entire college community. “It’s really a testament to the energy and enthusiasm of the student leadership, and to the faculty who shepherd students through the Trow application process,” he added.